My students LOVE anything nonfiction. Whether it is about space, the weather, trucks or animals (a particular favorite with second graders), learning more about a topic is where it's at. 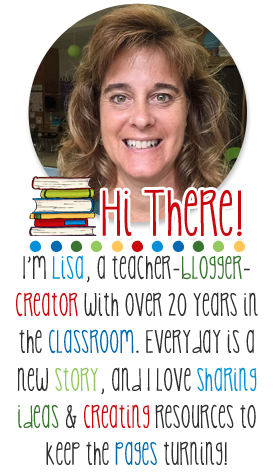 I came across this pin while I was looking for ideas on how to teach nonfiction text features. I knew this would be a great idea to use with my kiddos because: (1) It was VISUAL! My kiddos could see how a nonfiction book was put together in one look, rather than flipping through pages; (2) It was INTERACTIVE! From putting the copied pages together into a scroll, to highlighting and labeling text features, my kiddos would be actively involved every step of the way; and (3) It was DIFFERENT! Just the idea of creating a scroll would be engaging for them. So, step one. I made copies of 3 of our nonfiction books. I made sure they had a variety of text features and would work well when placed end to end. I chose one on leaves, pumpkins and apples to go with our fall theme. 6 copies meant I could have 3 students in each group - very manageable. Then we made the scrolls. I actually did this with whichever kids were waiting for buses to be called in the afternoon. They were so excited to find out what we were going to do and the fact that THEY create the scrolls added to them being more invested in the whole lesson. I have to tell you - this was not the first lesson we had done on nonfiction text features. 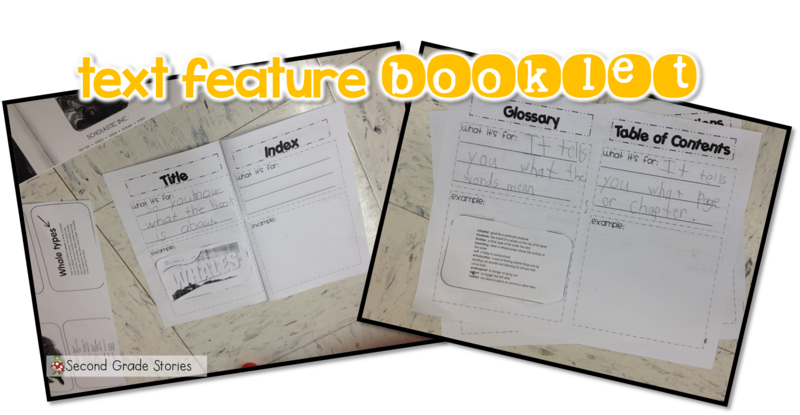 We had already looked at different nonfiction books, worked with features such as the index, table of contents, captions, etc. I wanted my students to have some familiarity with the features before we did this so everyone would be more successful. Wow! The response was amazing! As soon as I took out the scrolls that had been created, you could hear and feel the excitement. "I helped make that one!" "Look! I see the title!" "Wait, the glossary will be at the end!" We unrolled the scrolls and spent a few minutes just talking about the text features they noticed. This was quick way for me to assess what they remembered and what I needed to make sure to focus on. 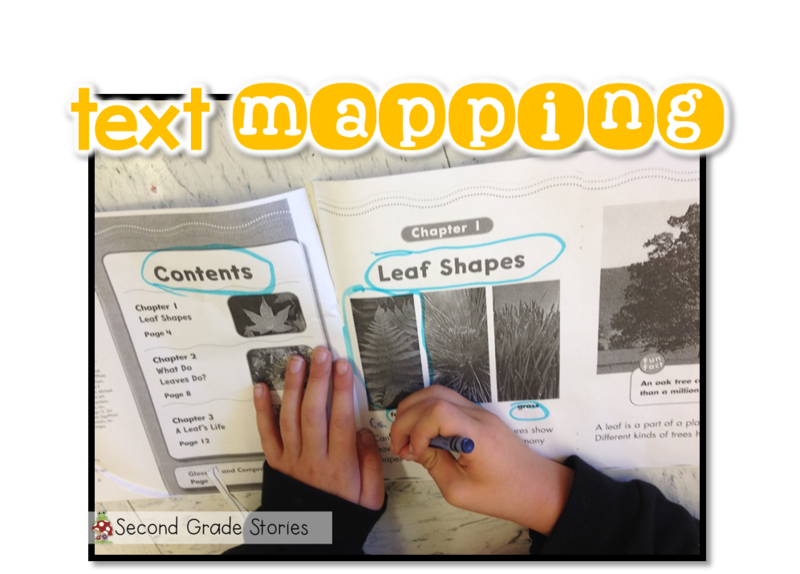 After having each person in the group share one example of a text feature - and its purpose - we started mapping! I went through the features one by one, showing them on a Powerpoint as we found them in the text. Students sat at the beginning, middle or end of the scroll and the person closest to the text feature we were talking abut got to circle it with the highlighter and label it. 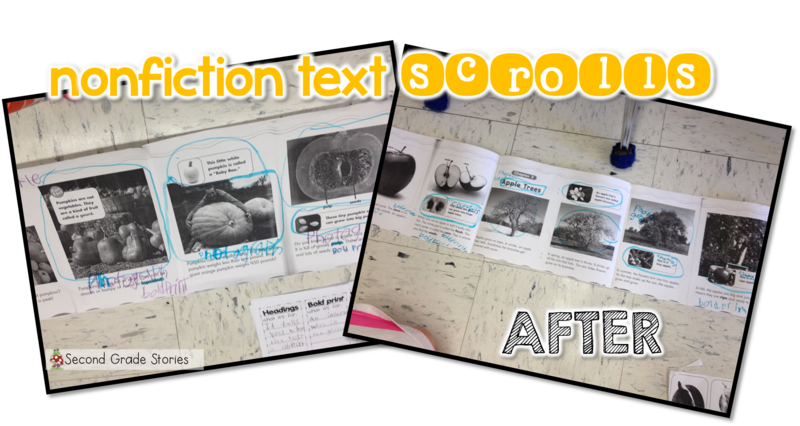 As we mapped the text, we also added to our nonfiction text features booklet. 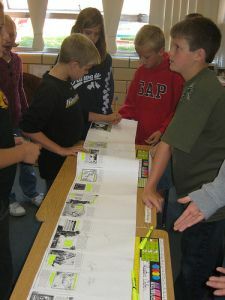 We spent two full days doing this, then each group walked around and looked at the other groups' text maps. By the time we were done with this, my students could easily locate and identify various nonfiction text features, and had a better idea of how they worked to help support the reader in finding information. I assessed the final time in two ways - first with flip flap books to match the feature and the definition. Then when I was meeting with small groups, I gave each student a nonfiction text and asked them to identify certain features, show where they would go to find___, use the ____ to ____. I had the same questions for each kiddo, but a different text. This really gave me a good idea of who could just identify the features and who could actually apply them. 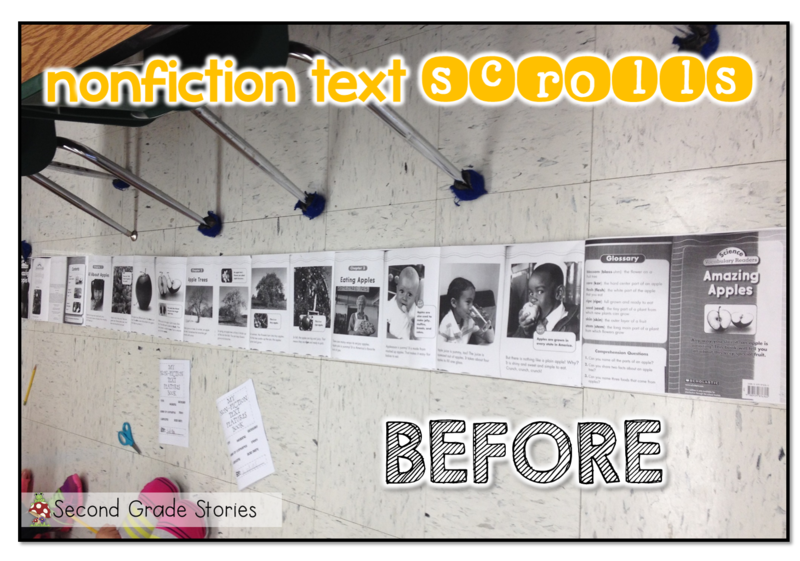 This definitely turned out to be a great way to show how nonfiction text features are organized and how they help the reader. I plan on using text mapping again in a few weeks when we get deeper into understanding the narrative structure of a story. I can see making a short chapter into a scroll and then highlighting the introduction of characters and setting, the rising action, falling action and the ending so students can really SEE how a story moves along. Let me know if you decide to try this in your room. I'd love to hear how it went! Amazing idea. Thanks for blogging about your process!